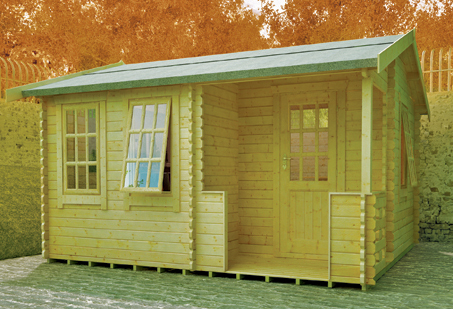 Superior Grade 44mm Interlocking Logs The building features high quality joiner made Georgian Style draft sealed key-lockable opening windows and Single Door inset into the cabin's unique porch. The shape of this log cabin allows incredible versatility as it can be used in so many ways. As a summer house, office space, games room or an outdoor gym. Featured on the Gyles are high quality brass lock handles and glass glazing as standard. Factory fitted pressure treated weatherproof heavy duty floor joists. Generous all round roof overhang which protects the building from severe conitions. Heavy duty green mineral roofing felt as standard. Easy fit moular floor for fast and simple assembly.